Under a George W. Bush-era executive order, oil pipelines crossing U.S. borders require a presidential permit, setting off a government-wide review that the State Department coordinates. President Barack Obama, in no rush to anger either environmentalists or energy advocates, has deflected criticism about the long-delayed decision by arguing that his administration is merely carrying out his Republican predecessor’s directive in the ordinary way. Since April 2004, when Bush signed his order, the federal government has taken an average of 478 days to give a yes or no to all other applications — less than a year and a half. The company hoping to build Keystone has been waiting for a decision for nearly 7 years — or more than five times the average. And while the State Department does bear responsibility for reviewing potential pipelines, former Bush White House officials who helped craft the policy say it was never intended that the final decision would be outsourced. After all, it’s called a presidential permit. The revamped process Bush created was intended to speed up, not slow down, permits for major infrastructure projects, those officials said. “It was seen as the most routine, boring thing in the world,” Robert McNally, Bush’s senior energy adviser at the time, said of approving pipeline permits. The company first applied in September 2009 for a permit to build the 1,179-mile pipeline, which would connect Canada’s tar sands with crude oil refineries on the Texas Gulf Coast. When Congress in 2012 gave Obama a deadline to make a decision, he rejected the permit on grounds he didn’t have enough time to thoroughly review it, but allowed TransCanada Corp. to reapply. The administration has declined to say what’s taking so long, or to offer insight into the deliberations. “This is under a review process at the State Department. That particular process is a process that predates this administration, so I’m not going to have any update for you from here,” White House spokesman Eric Schultz told reporters recently. With a flat “yes,” though, he did promise a decision sometime before Obama leaves office. Under Bush’s executive order, the State Department receives permit applications and circulates them to agencies like the Commerce Department, Energy Department and the Environmental Protection Agency. Those agencies have 90 days to offer their opinions. If the State Department decides to grant approval, it notifies other agencies, which have 15 days to object before a permit is issued. The final call comes down to whether the project is in the nation’s interest. In a major climate change speech in 2013, Obama established a litmus test, saying Keystone wouldn’t move forward if it was shown to significantly increase greenhouse gas emissions — a matter still hotly contested. The process doesn’t typically drag on for so long. The first permit issued after Bush revised the process in 2004 took less than four months from application to signature. Express Pipeline, L.L.C., was expanding a crude 785-mile pipeline crossing the Canadian border from Hardisty, Alberta — the same town where the proposed Keystone XL would start. Even the pipeline that took the longest to approve — the 435-mile Vantage Pipeline Project, approved during Obama’s tenure — took fewer than three years, despite requiring complex negotiations with multiple Native American tribes concerned about historical preservation. The 1,000-mile Alberta Clipper Project, which drew legal challenges from Earthjustice and other groups, took 25 months to approve. Not including Keystone XL, eight applications for new or significantly upgraded petroleum pipelines have been processed since April 2004. 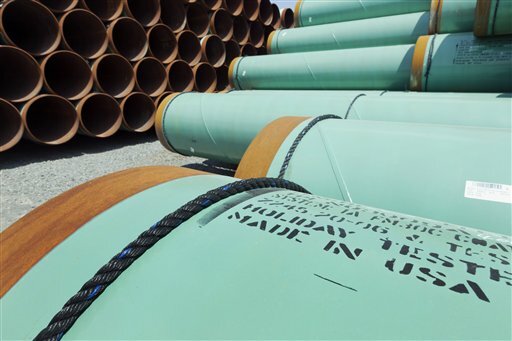 The AP’s review excluded permits reissued for existing pipelines due to change of ownership.